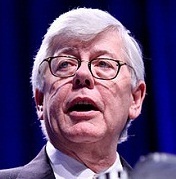 On March 29, The Constitution Project presented its annual Constitutional Champion awards to David A. Keene, former chairman of the American Conservative Union, and the Digital Due Process Coalition, a diverse coalition of technology companies, privacy advocates, and think thanks. Al Hunt, executive editor of Bloomberg News, and Judy Woodruff, senior correspondent for "PBS NewsHour," acted as masters of ceremony. Former Congressman Mickey Edwards (R-OK) and Morton Halperin, senior advisor to the Open Society Foundation, presented the awards.